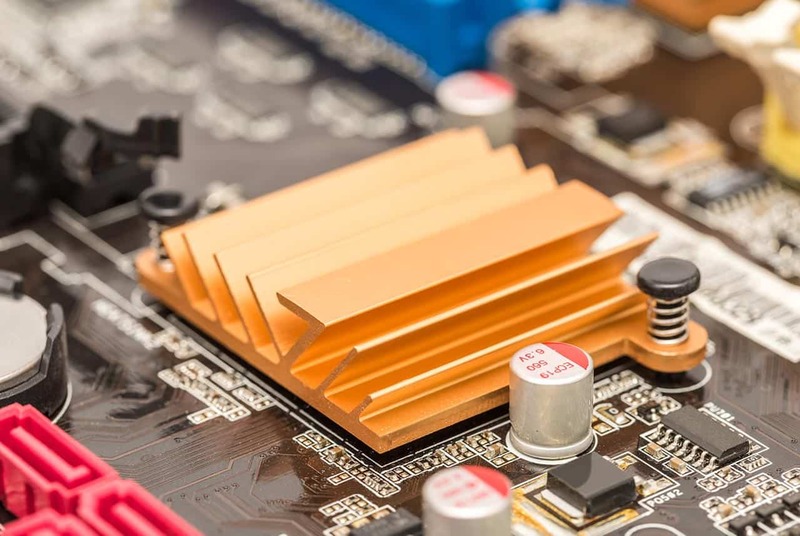 Many of these materials require a mechanical clamping pressure to hold the parts together and to maintain the performance of the thermal joint. The applied pressure can help expel air and produce more complete wetting of the material at the interface. 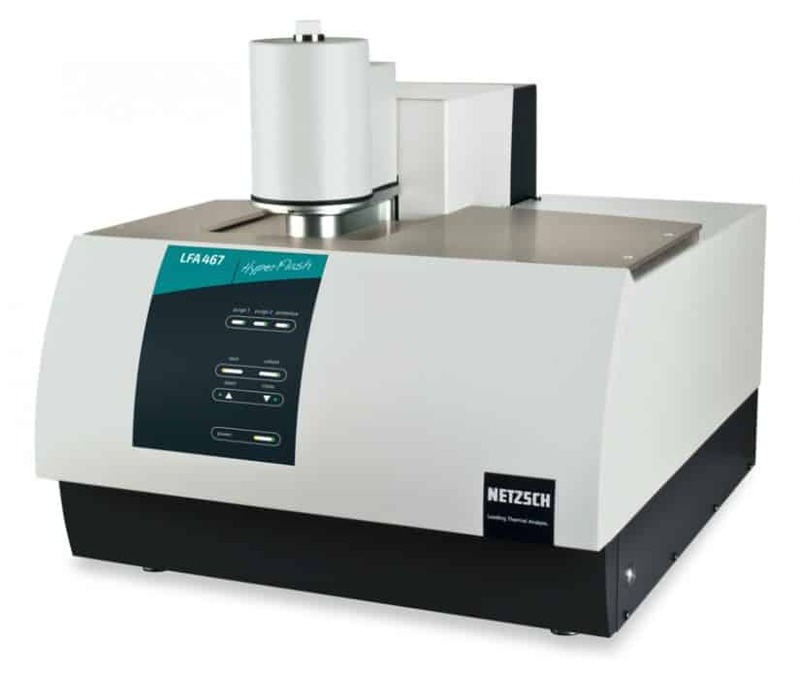 The Laser Flash method (LFA) is commonly applied to measure the thermal conductivity (W/(m∙K)) of TIMs. It monitors the thermal diffusivity (mm2/s), which is a measure of how quickly a temperature disturbance can propagate through a material. For LFA measurements (figure 1), a special clamping fixture was implemented to allow measurement of the thermal resistance and thermal conductivity of interface materials in a sandwich configu­ration under a known clamping pressure. The total thermal resistance as a function of gap thickness at each nominal pressure level is plotted and linear regression is performed. 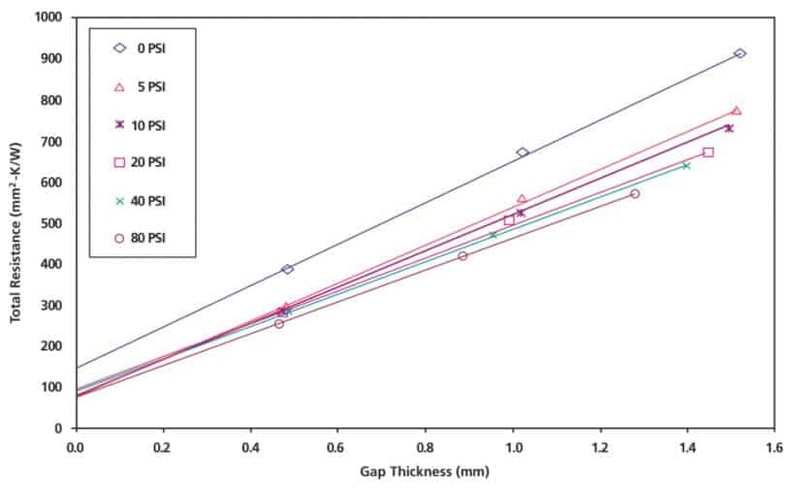 The y-axis intercept or zero gap thickness resistance represents the contact resistance, and the material bulk thermal conductivity is determined using the reciprocal of the slope. The results show that once a low clamping pressure is applied, the contact resistance is reduced and not very sensitive to pressure. A possible explanation for the increase in thermal conductivity (see also table 1) with clamping pressure would be that there is a small increase in the material density and conductive filler particle-to-particle contact due to constraints in the material flow caused by surface adhesion to the substrates.